Since launching the pitch in 2017 The PC Indie Pitch has only gone from strength to strength, in doing so visitng new regions and highlighting some of the most exciting indie games in development. 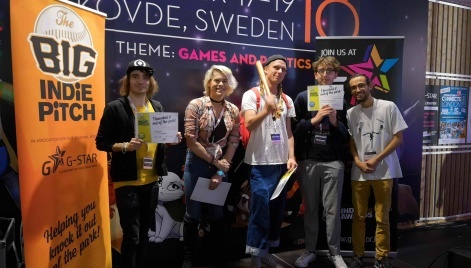 In fact, most recently we headed to Skovde in the Swedish countryside to host The PC Indie Pitch at Sweden Game Arena 2018 and reveal even more undiscovered indie gems. For those not in the know, the PC Indie Pitch is a regular event run by the makers of PCGamesInsider.biz. It gives indie developers the chance to pitch their games to industry experts and journalists in a speed-dating-style format. Teams get the opportunity to get valuable feedback on their games, as well as win great prizes such as promotional packages and, more importantly, the coveted PC Indie Pitch bat, a prize that developer Midjiwan walked away with this year for the pc port of their hit mobile title The Battle of Polytopia, defeating a 11 other developers in the process. They weren't the only developer that walked away with a prize though, as Sand Gardeners's Brownie Cove Express was awarded the prize for second place, with Hayfever by Pixadome rounding out the top three. Read on to learn more about The Battle of Polytopia, alongside the two games that walked away with our prizes for second and third place. Already successful on mobile platforms, Midjiwan's PC port of The Battle of Polytopia had a lot to do to convince the judges that an already successful game was worthy of The PC Indie Prize. However, that's exactly what they did, as they showcased just how well this bite sized turn based strategy game with low poly graphics can work on PC, especially laptops. For those who may never have played the mobile original though, in The Battle of Polytopia players choose from one of twelve different tribes before hopefully leading them to victory by expanding their empire and researching new technologies. If you like strategy titles on PC then this is defintiely one to watch. What do trains, ghosts, memories and snow all have in common? Well for one they all feature heavily in Sand Gardeners' surreal and atmospheric interactive fiction game Brownie Cove Express. However, to find out just how these blend together, players will have to jump into the game when it is released. Nevertheless, in just the five minutes they had to pitch the game Sand Gardeners were certainly able to grab our judges attention, and leave them just wondering what fate awaits those on the Brownie Cove Express. Hayfever is an adorable solo platformer based entirely around utilising seasonal allergies to gracefully race your way through a variety of diverse and action packed levels. Within these levels players can also utilise a range of power-ups as they watch out for the likes of scarecrows, pollen spitting flowers and cats, amongst a variety of other allergy infused enemies. Once a level is complete players can also race against their own ghost in order to set new high scores. Want to show off your exciting new game? We host Big Indie and PC Indie Pitch events throughout the year, so be sure to keep an eye out on our events page for an event near you.